Pretty solid abilities at this cost. Incredibly impressive. 2R to remove everything from Chalice of the Void to Ugin, The Spirit Dragon? AND it can totally just beat down or be removal?! Yes please. This a beautiful design. I am going to call this card Abrade goblin. Weird way to say "artifact" unless they're planning on bringing back non-artifact colorless (eldrazi) or colored artifacts (Phyrexian). I've suspected for a while that Ravnica is going to be the target of a Phyrexian invasion, likely masterminded by Nicol Bolas, or even by Tezzeret going rogue. And that's why we're getting all the guilds (AKA two color combos) in the first two sets. What of the third one? Well, that's the new artifacts set. There are a few other hints for this, too. Or it's possible that it's the new Eldrazi set. Hopefully not, though. 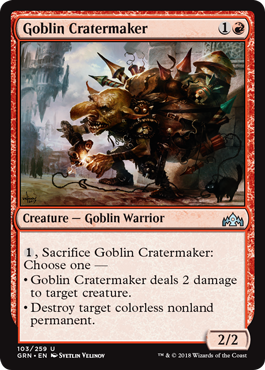 Besides, I doubt they'd let this little guy kill Emrakul in Standard. My guess was they're just making it work better in modern/edh.